Today I share with you my loyal readers, a hockey experience that took me completely by surprise in the best possible way. I never win contests…ever. I have entered many contests for the chance to win hockey tickets. Did I mention I NEVER win contests [especially never when it comes to contests that involve social media]? Have you ever entered a contest through social media (Facebook/Twitter) where the winner is randomly selected? I am never so lucky to be that randomly selected person…Ever. Surprise, surprise. That is until Monday March 17, 2014 when I received a notification on my twitter account announcing that I had won the Canucks for Kids Telethon panel contest. Winning the contest meant I would be allowed the privilege of participating on the telethon panel pre-game and two tickets to watch the game from the press box on Wednesday March 19! Great news to receive on a Monday afternoon, I’d say wouldn’t you? 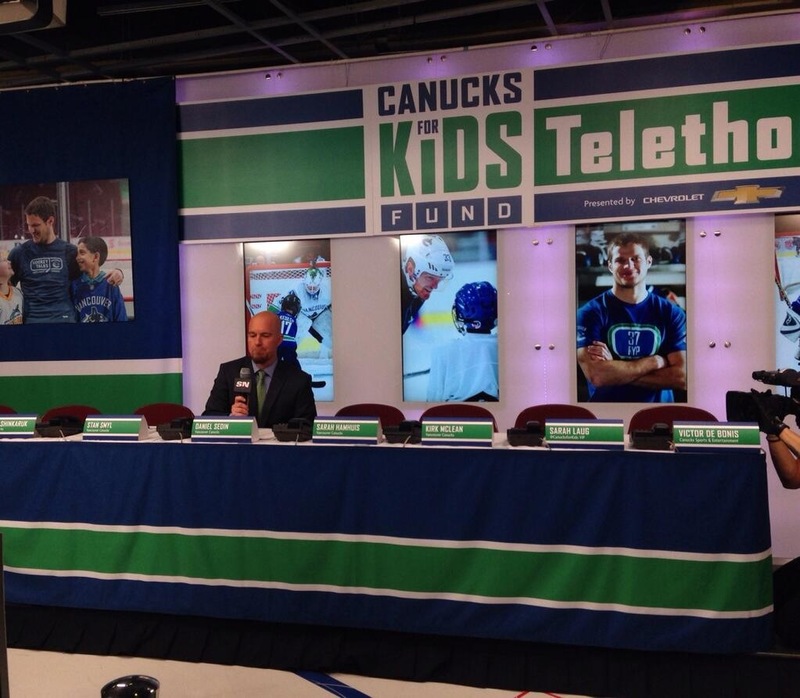 “The Canucks for Kids Fund dedicates resources to assist charities which support children’s health and wellness, foster the development of grassroots hockey, and facilitate and encourage education in British Columbia. Thanks to the generosity of our fans, donors, players, employees and sponsor partners, the Canucks for Kids Fund (CFKF) has granted more than $41 million to charities in British Columbia over the last 27 years. The Canucks for Kids Fund raises awareness and funds through several charitable initiatives including: Canucks for Kids Fund 50/50, Canucks for Kids Fund Dice & Ice Benefit presented by HSBC, Canucks for Kids Fund Superskills powered by Rogers and the Canucks for Kids Fund Telethon presented by Chevrolet. The Canucks for Kids Fund also raises funds through partnerships with Special Olympics BC’s Sports Celebrities Festival and the Vancouver Sun’s Raise a Reader Day. 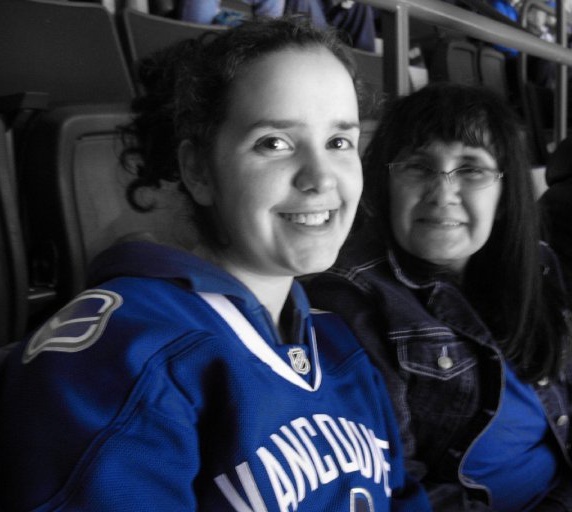 Our core beneficiaries, Canucks Autism Network (CAN), Canuck Place Children’s Hospice and BC Children’s Hospital Foundation are providing vital resources and life-saving care to families all across this province.” [The Official Canucks For Kids Fund description from the Vancouver Canucks website]. Every year the #CFKFtelethon is usually around my birthday-(March 14) and every year I make a donation and this year was no different in that regard. The only difference this year was thanks to the aforementioned contest, I got to be a part of the telethon panel prior to the game. First things first…I had to choose someone to take with me to the game. Let me tell you, there are A LOT of contenders for such a moment. 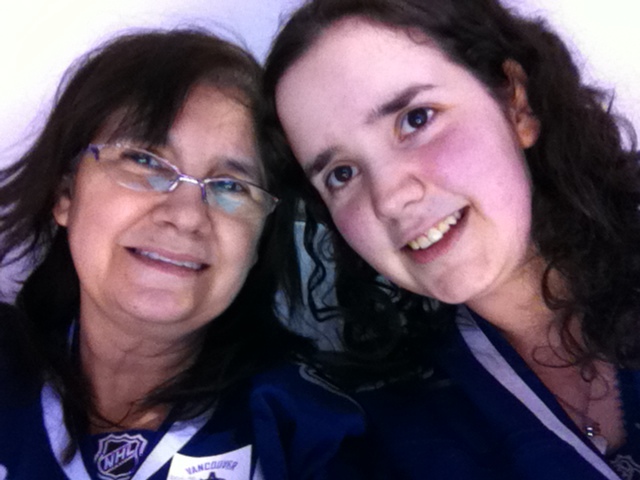 In the end it became a simple task…bring the one person who loves hockey and the Canucks as much as or possibly even more than I do….my mom. No one quite understands how much I love this crazy game of hockey or how this game can completely captivate a person quite like my mother. Hockey is more than just game, it is a bonding experience between: fathers and sons, mothers and daughters & everyone in between. This particular evening would be a mother/daughter experience. First things first we had to enter through Gate 9 (which is more tricky than it sounds with all of the construction around the arena!) to pick up our VIP passes that would give us access to level 500. Next up we made our way to the Telethon set so I could get my final instructions as to what being a part of the panel meant. 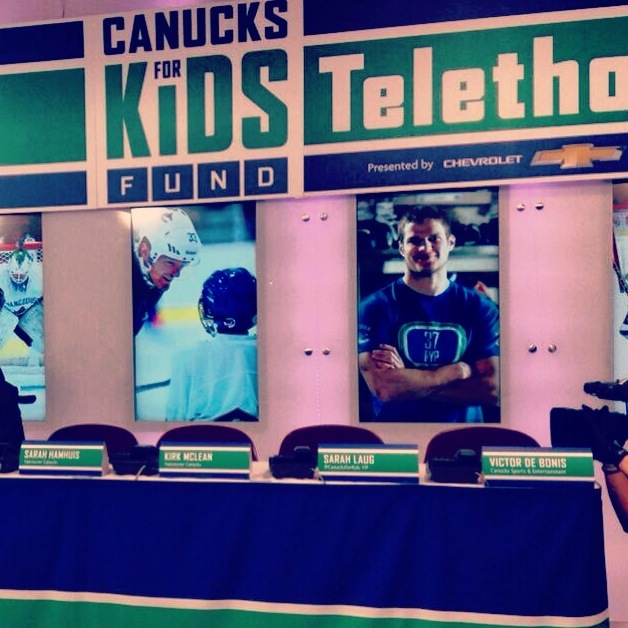 Welcome to the 2014 Canucks For Kids Fund Telethon! Walking onto the set was a very wow moment, the experience was suddenly very real. 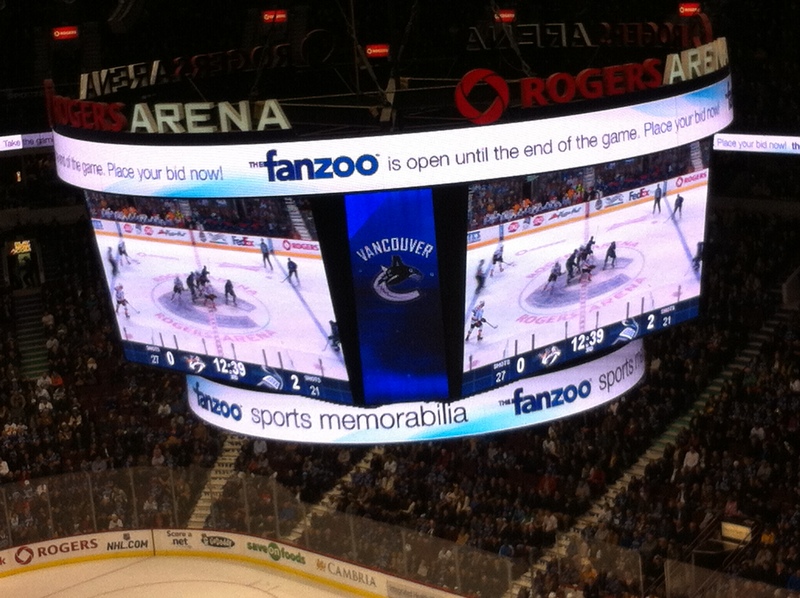 The set was just outside of section 121 on the 100 level concourse of Rogers Arena. Fans were coming and going all taking in the set and those who were on the set as they made their way to their respective seats. The phones, surveys, and donation forms were all lined up along the table with each volunteer’s name card in place. All panelists were to be there seats by 6:40 PM (PT) as the Telethon was set to go live at 6:45 PM (PT). Let me just say it was quite something to see the all-star line-up for the Telethon take their places on the set. 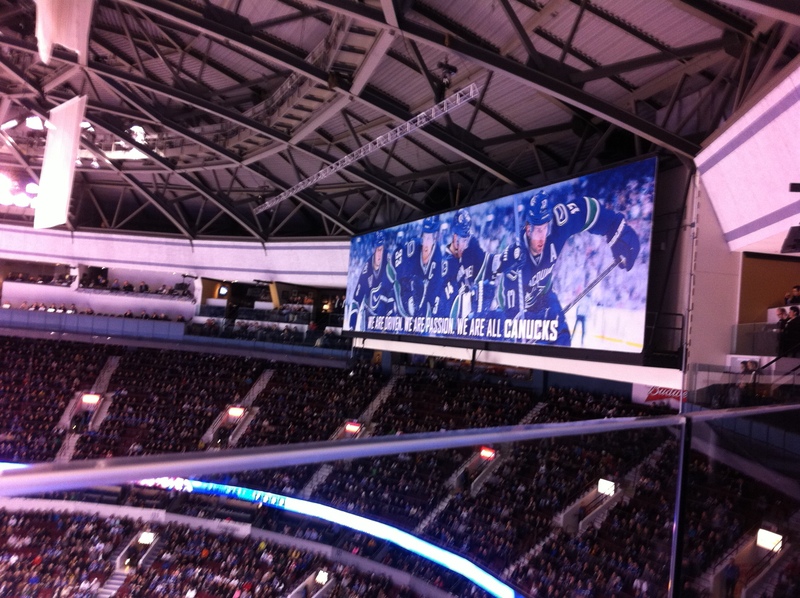 Canucks from the past, present and future all took their places…and then there was me somehow also a part of the mix! All I could think of as I took my seat on set was, how did I get so lucky as to get to be a part of this amazing moment?! Look at that…my very own SPOT on the panel! Right between #Captain Kirk & Victor De Bonis. No words. Forever a Canuck himself, Trevor Linden was our host. Notable Canuck names on the panel included: Kirk McLean, Daniel Sedin and his wife Marinette, Hunter Shinkaruk, Sarah Hamhuis, Stan Smyl and more. Did I mention I had the privilege of sitting NEXT to Kirk McLean?! How often can one Canuck fan say they are in the presence of so many Canuck personnel?! To say I was slightly star struck and completely in awe of everyone and the scope of the moment, is more than fair. There I was suddenly surrounded by so many amazing people gathered together for an amazing cause. Deep breaths, this was real. This was happening and this was my reality during the telethon. Star power everywhere you turned. The countdown began and suddenly we were live, phones started ringing, calls and pledges were made. Donors around the globe made a difference for BC kids. My shift on the panel went by both very quickly and slowly. There were moments when it felt like it was speeding by and others when it felt like each moment was slowed frame by frame. 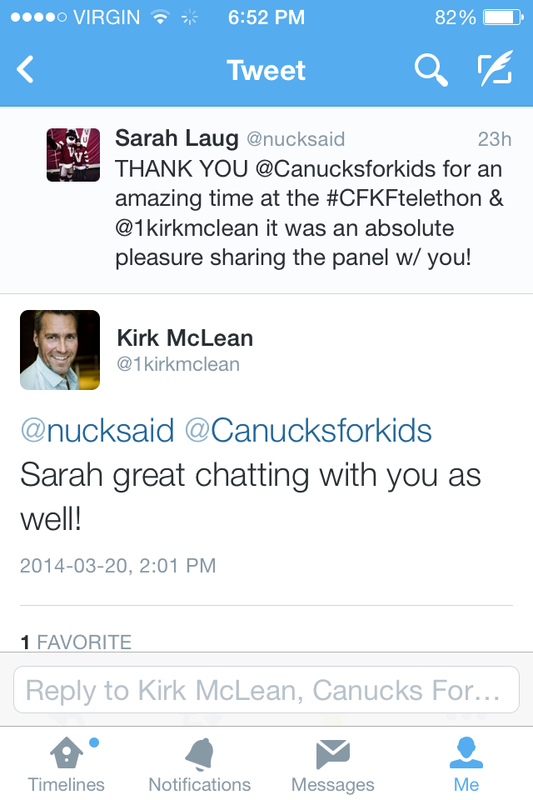 Did I mention how amazingly welcoming and kind Kirk McLean [and everyone else] was?! I am still taking in the fact that all of these moments from being part of the panel to meeting Kirk McLean really happened. It was a pretty big deal for this Canucklehead! As much I wish I had the time to take a picture or two to capture the reality that I met all of these people…once the Telethon went LIVE, there was ZERO time to stop for picture taking. Following an experience on the panel that I will never forget…I tweeted my thanks to those involved & received this more than kind response from #CaptainKirk himself! Calls were made and pledges recorded, and suddenly before I knew it, my shift on the panel was over. I was ushered with my mom from the elevator to the 500 level to our box seats to watch our Canucks take on the Nashville Predators. The very idea of sitting in box seats was an absolute treat and delight for these two Canuck fans who on a regular day would never be able to afford such a luxury. A view from the top that will forever be appreciated and will make going back to regular viewing only ever so slightly difficult. The view from the box was beyond amazing. It felt like we were living the luxurious life for the evening. My mom and I are not used to seeing the game with a completed unobstructed view when watching the game live from the arena because inevitably when sitting in the lower or even the upper bowl someone taller sits right in front of us. This amazing view and experience will not long be forgotten. The on-ice pre-game intro was incredible to full-lentgh view from so high up! Rink wide view of some early first period action! 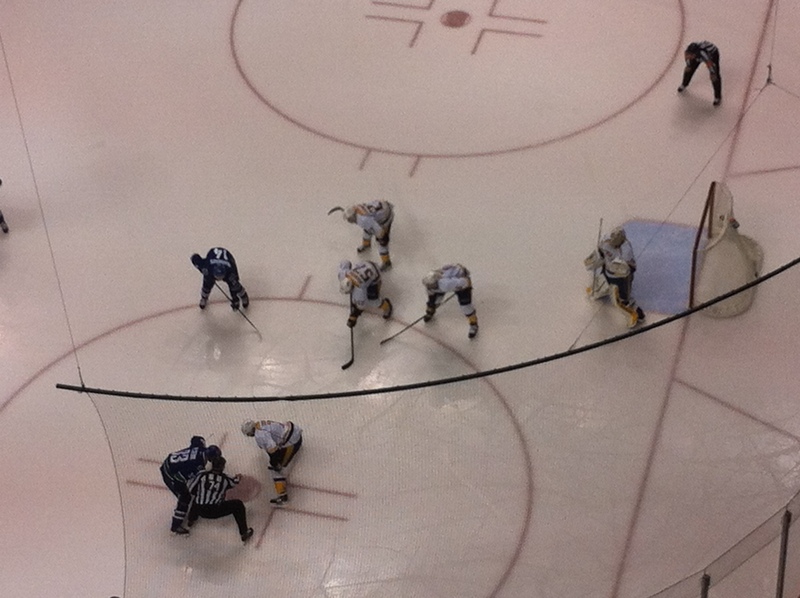 A quick snapshot of a 2nd period faceoff. The middle frame saw some of the game’s best chances by the home team. The Canucks had SO many chances in the 2nd period and it seemed as though all puck luck was against them…and a late penalty in the middle frame seemed to confirm that bad luck. Cue a must win third period….and some heroics by rookie Jensen and a certain defense-man. Before the announcer could even finish announcing the Nashville penalty he interrupted his own announcement with SCORES!!!!!!!!!!!!! 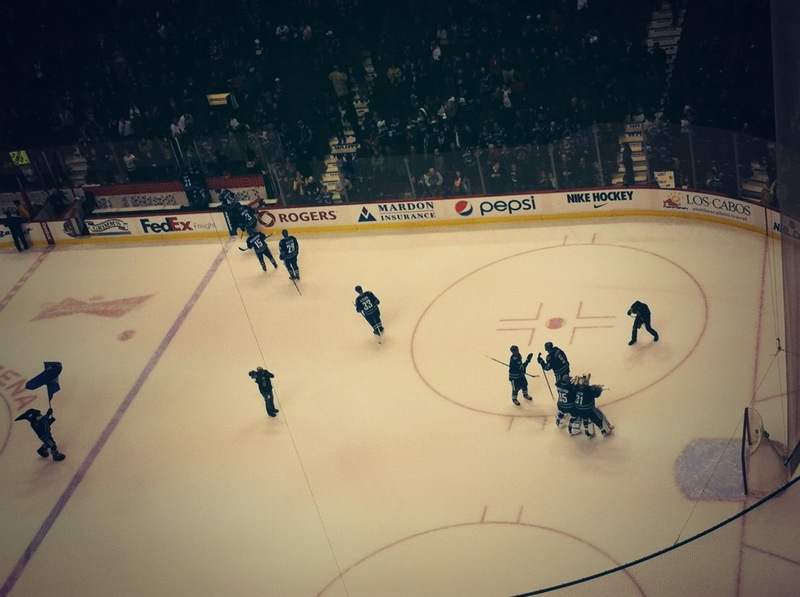 as Edler scored the insurance goal needed in this game. The Canucks and 2-0 leads have not fared well as of late as we are all to well aware and the question many were asking is: would they be able to hold onto the lead in regulation? Nashville had plenty of opportunity late in 3rd period with back to back power-plays in the final 5 minutes to comeback and force extra time. The good news is that Eddie Lack stood tall and the defense held the fort not allowing even one puck to cross Lack’s goal line. While the clock ticked away, the arena erupted in an EDDIE, EDDIE, EDDIE chant! 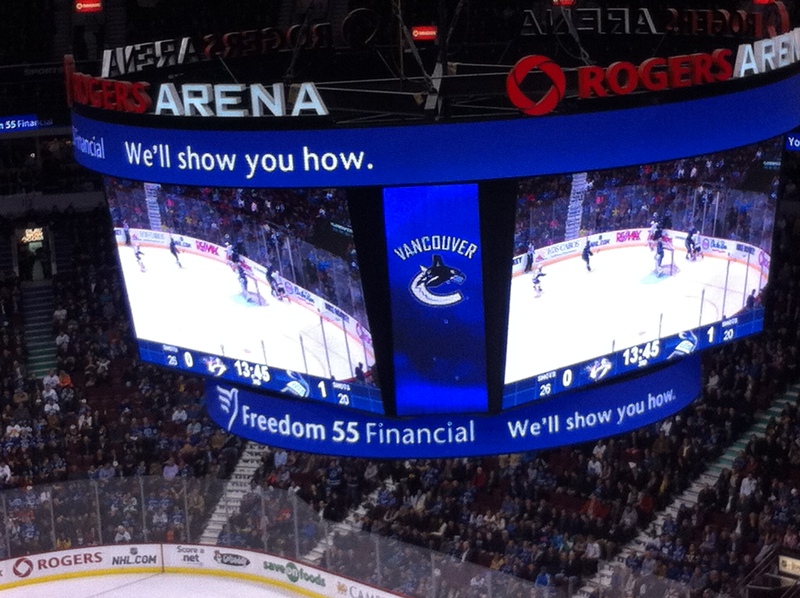 Canucks won 2-0 in front of a delighted home crowd. 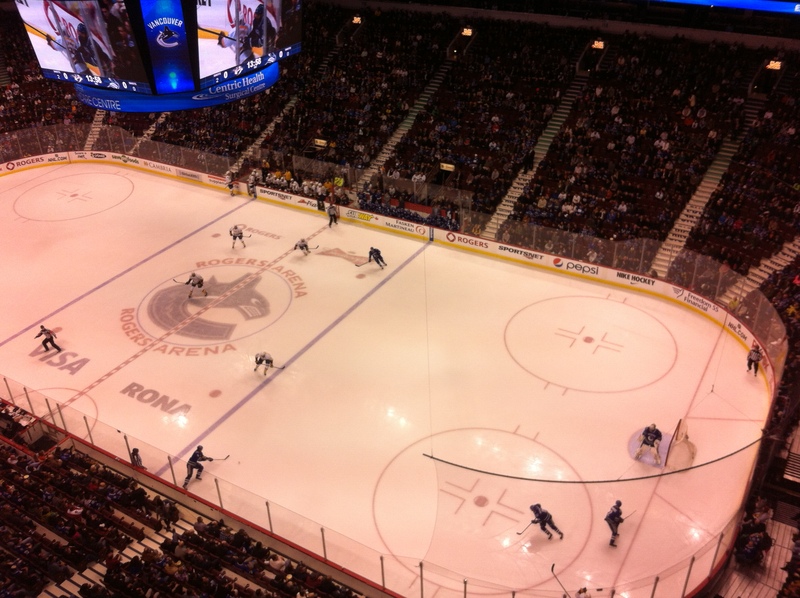 Lack picked up his 4th career shutout and stole a very important 2 points for the Canucks as they finished the night perfect in the special teams department killing their 4 penalties and scoring 4 seconds into their single power-play opportunity. It was a WIN, WIN, WIN! The whole experience felt completely surreal. From literally being a part of the panel with some of the best of the past, present and future Canucks to having the press box view; it most definitely was an evening that I will never forget. I cannot thank the Canucks for Kids Fund and the Vancouver Canucks enough for this amazing experience and allowing me a glimpse behind the scenes. Thank-you does not seem enough for an organization that does so much for this province, but a most sincere thank-you I extend all the same. Thank-you for an incredible experience from start to finish and an evening that I will never forget. 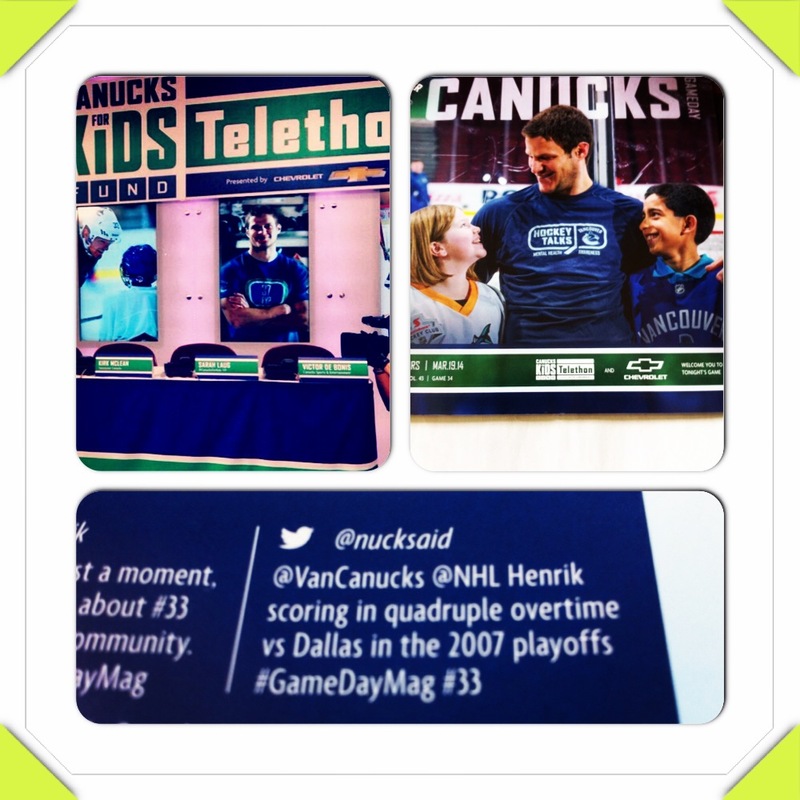 Yep…that is ME(@nucksaid) in the #GameDay program! What are the odds that the same game I was lucky enough to attend in style would also be the game that featured ME in the #gameday program! I present to you the #LACKstrom dance – featuring the star of the game Eddie Lack and his trusty back up Jacob Markstrom. 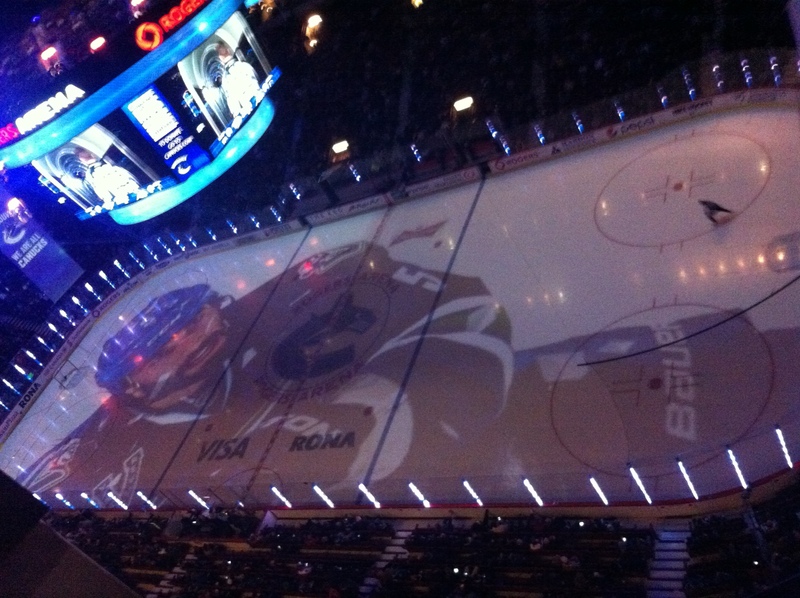 It was truly an experience that any Canucks fan would have been lucky to have and I will never forget a minute of it. Every moment is forever etched in my memory. Thank-you again to all who were a part of giving my mom and I an evening that we will never forget (a home win from the Canucks was just icing on the cake! ).